The quiet community of Ocklawaha wraps around the north shore of Lake Weir, about twenty miles southeast of Ocala. In the summertime Lake Weir is a popular water-skiing and fishing spot. 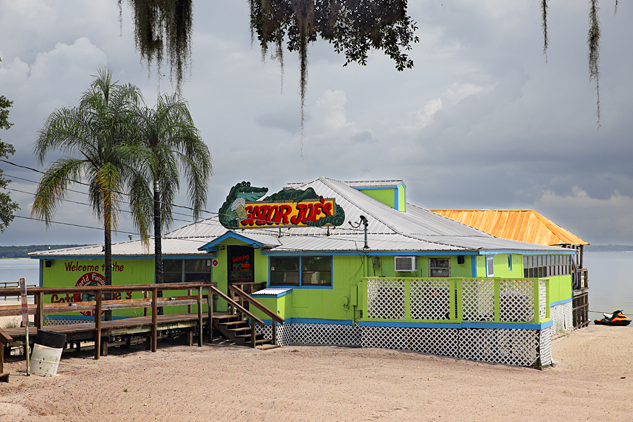 Cabins and docks line the shore, and Gator Joe’s Beach Bar and Grill—in an old 1926 stilt building, sits on the lake’s edge. 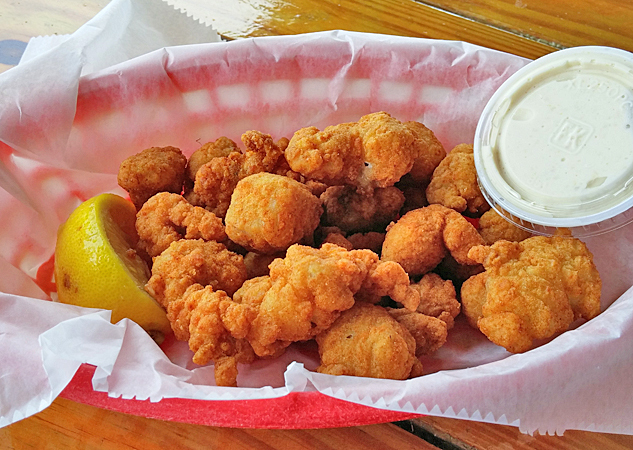 It’s a good joint for Florida cracker cuisine—frog’s legs, fish sandwiches, and gator tail. Water-skiing, fishing, and eating some good grub is about as exciting as things get around here. But eighty years ago, less than a quarter-mile down the beach from Gator Joe’s, the reign of one of history’s most infamous gangs ended in a bloody gun battle with the FBI. One hour before dawn on the morning of January 16, 1935, residents of the sleepy central Florida town of Ocklawaha simultaneously bolted upright in their beds, startled from their deep slumber by the rapid and continuous blasting of machine guns. It continued without pause for forty-five minutes and then went on sporadically for another five hours, until FBI agents decided that notorious gangsters Ma Barker and her son Fred were surely dead. Ocklawaha is a place far enough off the beaten path that if you were so inclined, you could hide away here for some time without being found. Arizona Clark “Ma” Barker, also known as Kate, must have had that same impression when she came here in November 1934 and rented a two-story, wood-frame house on the shore of Lake Weir under the alias Mrs. T. C. Blackburn. The Barker boys—Herman, Lloyd, Arthur (who was called “Doc”), and Fred—had always been bad eggs. As kids, they were bullies and thieves in their hometown of Webb City, Missouri, and later in Tulsa, Oklahoma. They spent most of their formative years in scrapes with the law. Ma, who as a child had seen in person and idolized Jesse James, not only tolerated these activities but encouraged them. She ultimately organized the Barkers into a criminal gang. In 1922, police officers caught Lloyd during a post office hold up and sent him to Leavenworth. In 1927, the oldest brother, Herman, shot himself rather than be captured following a gun battle with police in Wichita, Kansas. Undaunted, the Barker gang continued its crime spree. The gang was joined by Alvin “Old Creepy” Karpis (nicknamed because of his menacing expression), a former Kansas State Penitentiary inmate and associate of Fred’s. For a while, bank robberies were their specialty, and they always left a trail of dead bodies behind—policemen, innocent bystanders, and sometimes fellow criminals. Then the Barkers figured out that there was more money in kidnapping than bank robbery when they abducted William Hamm Jr. of the Hamm Brewing Company in St. Paul, Minnesota. They collected $100,000 ransom for his release in June 1933. In January 1934, Fred and Old Creepy kidnapped wealthy St. Paul banker Edward Bremer. Bremer’s family paid $200,000, and he was returned unharmed. By now the Barker gang was at the top of the FBI’s Most Wanted list. They were on the run. They even went so far as to have a doctor accomplice try to surgically alter their faces and scrape their fingers so their prints would be unrecognizable. The gang split and went in different directions to try to foil the FBI. That may have been the beginning of their downfall. In January 1935 in Chicago, FBI agent Melvin Purvis caught Doc and sent him to Alcatraz. In Doc’s apartment, agents found a map of Florida with a circle drawn around Ocala and Lake Weir. Ultimately, however, it was the Barkers’ cruelty to animals that pinpointed their location for the FBI. When Ma and Fred Barker (a.k.a. the Blackburns) first settled in Ocklawaha, they were considered friendly by the locals. They were regulars and big tippers at the bar. But before long, boredom got the best of Fred, and he took to shooting at ducks on Lake Weir with his machine gun. This did not set well with the locals. When Fred let it be known that he wanted to hunt down “Old Joe,” a legendary but harmless old alligator that lived in the lake, the locals were enraged, and word of his intentions spread. His description matched one given by the FBI, and in the early morning hours of January 16, fourteen agents surrounded the house. Chief Agent E. J. Connelly announced, “We’re from the Department of Justice. Come out one at a time.” Ma barker yelled, “All right, Freddie! Go ahead!” and the Barkers opened fire. FBI agents fired over fifteen hundred rounds of bullets into the house in three-quarters of an hour and then continued to shoot through the windows intermittently for several more hours. When they finally went inside, they found Ma and Fred dead on the floor of the bullet-ridden upstairs bedroom. They also found an arsenal of rifles, machine guns, pistols, and ammunition. Ma still clutched her machine gun in her hands. A year later, J. Edgar Hoover caught up with Alvin Karpis in New Orleans. Karpis spent thirty-two years in prison. Ten years after his release, he died of a drug overdose. Lloyd Barker served a twenty-five-year sentence and then was shot by his wife two years after his release. In 1939, Doc Barker attempted to escape from Alcatraz. He made it over the walls and was standing on the shore of the island when guards fatally shot him. The house is still there—largely unchanged and sitting on nine acres of valuable lakefront property. It was built in 1930 by businessman Carson Bradford as a vacation home, and is still owned by his family. It’s a simple, pale yellow, wood-frame two-story with a screened porch downstairs—no different from a dozen other older houses along the shore at this end of Lake Weir. 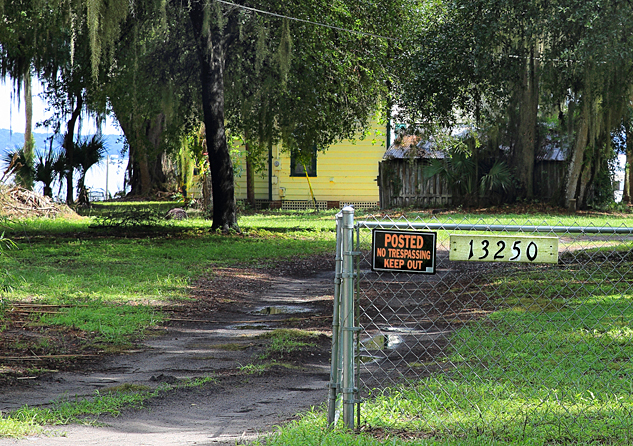 To get a glimpse, drive west out of Ocklawaha on County Road 25 and watch on the left for a gate with an address marked “13250” and a “Posted No Trespassing Keep Out” sign. It is private property, so do not go through the gate. The owners had been willing to sell it to the state (for significantly less than its commercial value) provided the state turned it into a museum. The state legislature approved it as part of the 2015 state budget, but the acquisition was vetoed by the governor’s office along with other projects, because—per the governor’s June 23rd letter: “…the projects did not go through the established competitive review process where projects of this type are ranked and recommended based on measurable outcomes…” As of this writing the fate of the house is uncertain.